My trusted primary dive computer during the last year of active scuba diving, a Mares Smart Dive Computer, is for sale at a great value for someone ready to put it back into use. It is currently listed on eBay for $200. In my transition back to the US, I am no longer in need of this crucial piece of dive equipment. As it turns out, this is also turning out to be a transition into selling dive gear online, which I’ve always wanted to do but never got around to it. Later today, the seller, that’s me by the way, will go to the US Postal Service to package and ship the item and since I offered free shipping, the tally shall continue to grow. (It ended costing $4.40 to ship to Florida) Cough up all that cost to the learning curve. It was a good lesson and it has prompted this seller to use his own site for promoting gear and sales. I’m not suggesting a split with ABCs genius business model. I am simply trying to find a way to reduce my fees and pass the savings on to the buyer. So, I’ll sell it for $190 to whomever contacts me via this entry as a test that niche customers are indeed reading the blog, one of them anyhow, and ship it to her/him anywhere in the US at my expense. If you are game, email me at info@qaulitytimedivers.com and inquire if it has been sold or not. We can go from there. The Mares Smart Wrist Computer has a clear display and is quite user friendly. The Smart replicates the display of the Puck Pro, adding an additional button, buttons are repositioned to the side, all packaged into a much slimmer profile. On the surface, adjust your nitrox settings or view your logbook with ease. Underwater, you can manage alternate depth information (top row), completely independent from the ancillary information displayed in the bottom row. Mares finished it with a two-color strap and unique design, making this the perfect companion for your time away from diving. When you are out of the water the Smart computers doubles as a trendy digital wristwatch. You will be able to stay on top of your daily tasks with a calendar, stopwatch, daily alarm, dual time modes and temperature reading when you wear the computer day to day. The Smart computer also features a user replaceable CR2430 lithium battery, has a memory capacity of 36 hours, and should last up to 200 dives on a new battery. At an affordable price point, extremely simplistic interface, and usable by both professional and recreational divers, the Mares Smart Wrist Computer packs a powerful punch and should be on every divers wrist. 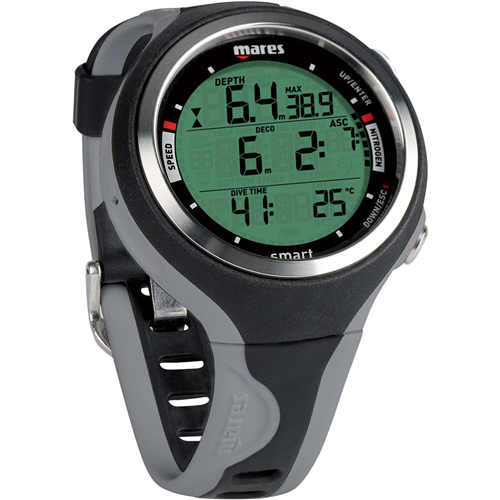 The Mares Smart Wrist Computer uses the RGBM Mares-Wienke algorithm, provides a depth display to 492′ (150 meters) can be set for fresh or seawater, imperial or metric measurements and is firmware upgradable through Dive Link.